Jeanna Neal and the Rev. Danny Neal stand in the sanctuary of New Beginnings Baptist Church, now housed in the building formerly occupied by Clear Springs Baptist Church. You might call them “the little church that could,” and the new residents of the former Clear Springs Baptist Church building are committed to serving their new community. New Beginnings Baptist Church started humbly with an impromptu service held in the Rev. Danny Neal’s living room. He was serving as a supply pastor at the time and had an off Sunday around Thanksgiving. He told a friend that he’d be having worship at home. That morning, 27 people showed up for church. Danny and wife Jeanna welcomed the group with open arms. The little church met at the Neals’ house until around Christmastime they had 55 people coming every Sunday. New Beginnings started meeting in a warehouse on Rutledge Pike, then moved to having services in five classrooms of East Knox Elementary School. Over the next six years, they grew to more than 300 members. When the Clear Springs congregation moved to their new campus on Tazewell Pike, Danny and the church leadership team looked at the property, but it was out of their price range. The building sat empty for more than a year before it was purchased at auction, and the buyer (a Clear Springs member who wishes to remain anonymous) offered to sell it to New Beginnings … at a fraction of the original price. Danny and Jeanna were on their April wedding anniversary trip when the buyer called. They canceled their plans and came back early. 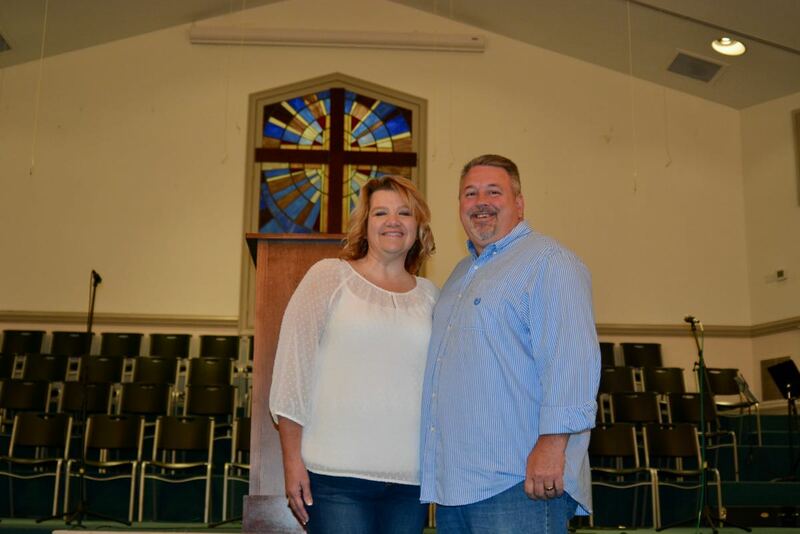 With offices, Sunday school space, a fellowship hall, kitchen and sanctuary, the former Clear Springs building was beyond the Neals’ wildest dreams for New Beginnings. They and the leadership team met the buyer at the church and had a worship service right then. The buyer gave New Beginnings access to the building immediately, and 10 people were baptized before the sale was final. New Beginnings has been getting to know the Gibbs community for the past three months, and they even made their annual mission trip a “home mission trip,” with youth and church members staying overnight at the church, then going into the community each day to do home visits and complete service projects. “Our goal is not just to be a church inside these walls,” said Danny. “My heart is to get together to love this community. Jesus said we should love him and love others, and if we do that everything will be OK. The church is not a museum for saints. It’s a hospital for the hurting. Right now, the church is getting settled in the new space, which gives them plenty of room to grow. Danny’s personal goal is to visit as many homes in the neighborhood as possible and simply offer to help. New Beginnings Baptist Church is located at 8518 Thompson School Road. For more info, visit their Facebook page.